Completely renovated, in excellent condition, with garden, furnishing cared and equipped with everything you need for a little bit longer stay. You have Air conditionning, TV with satellite, DVD, the telephone for national local, computers, printers and ADSL wireless with free access to Internet. 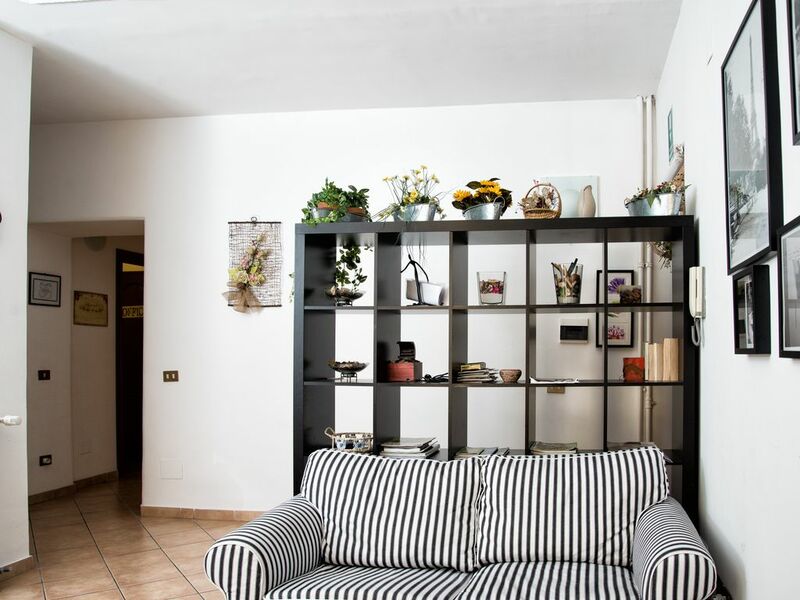 It is located in a quiet and not noisy and at the same time is between l'appia and the Tuscolana, ways that offer many services (cinema, restaurants, Library, a variety of supermarkets and characteristic shops ). Less than 100 metres, a subway and just one bus will permit you to reach Piazza di Spagna , Piazza Venezia, San Pietro, the Coliseum, Trevi Fountain and more. This place was very spacious and beautiful. It far exceeded our expectations. The patio was beautiful and private. It was a nice place to sit in the evening and enjoy the fragrant flowering vines. It was close to the Metro stop, a grocery store and some good eating places. The owner was wonderful. My daughter received a job offer while were in Rome and the he went above and beyond to help her get her offer printed, signed and returned in order to accept the job. He also helped us arrange a taxi to our cruise ship at the end of our stay and followed up to make sure everything went well for us. I would definitely stay here again and recommend it to anyone staying in Rome. The apartment is modern & clean. The bedding is nice & the beds are comfortable by European standards. The bathroom is large as are the bedrooms. The owners are professional & friendly. As other reviewers have stated, the metro & shops are very close. The place is easy to find from the metro. No problems! Very clean, modern & tastefully decorated apartment in a great location. A very short walk to the metro & to grocery stores. The metro is so easy to figure out & get around the city very quickly & affordably. A good size for four people. There are two separate & large bedrooms. The beds are comfortable by European standards. The bedding & towels are of good quality. There is a washing machine in the large, bright bathroom. The terrace is really nice. They even provide a computer in a small office in the apartment for you. Enrico & his family are very friendly, professional & willing to assist you however they can. No regrets! We will definitely try to book this place again if we are every lucky enough to return to beautiful Roma. Thanks Enrico! Ideal accommodation in every respect. All you need to know - clean apartment with lots of space, all the facilities you could wish for, perfect location for Metro, supermarket and local restaurants, friendly helpful owners. Excellent value for money. Even had we not performed the required ritual at the Trevi Fountain, we know we will be back ! This was a very memorable visit to Rome for all the right reasons. "It was the very good, perfectly clean appartment situated in the silent and nice area, near the center. 5 minuts to metro station,10 minuts - to train station, 2 minuts - to nice garden. There is lot of good and not expensive shops and cafe near the apartment. The apartment has everything, what you need (include computer, printer and telephon). The best choice for families with children or teenagers. The owners are very kind, helpful and fiendly." (Text automatically translated) From Fiumicino "Leonardo da Vinci" and the port of Civitavecchia, take the train to the Tuscolana then bus 85 for 2 stops. If you arrive with l 'car Take the Via Appia or the Tuscolana. (Text automatically translated) The Caffarella Valley entrance on Via di Vigna Fabbri, 600 meters from the apartment, within walking distance or by bus 87 or 118, you arrive in the valley of Cafarella enjoying the panorama of the whole district. The Caffarella Valley, crossed by the river Almone, is the theater of myths and legends, and was reflected in the history of Rome, the city and the culture.